Now that you’ve won the job you want to make sure that it gets started on the right foot. The estimating team has already spent hours working on the project – ranging from entering basic project information and uploading documents to identifying low bidders on bid day. 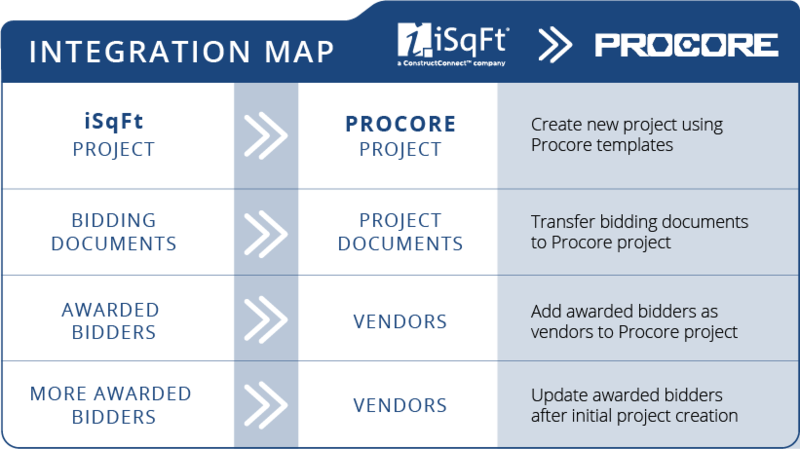 This integration between iSqFt and Procore allows you to easily share the key information they’ve gathered with the team that will be building the job, saving them time and driving collaboration. Thank you for contacting us. An iSqFt representative will be in touch. Share key information in one easy-to- perform step. This allows you to save time and jump right into the project instead of spending time manually entering vendor information and uploading documents. Give your project team the same information every time when they’re getting a project started. This helps set expectations and reduces the chance for errors that can occur with manual data entry. Collaboration is critical to successfully move a project from estimating to the field. Give team members access to the same information, streamlining the process and making conversations more productive. When your systems talk to each other you can be more confident that everyone is on the same page. This also helps to reduce the amount of duplicate effort required for everyone to do their job each day. Contact us and we’ll connect you with someone who can tell you more.